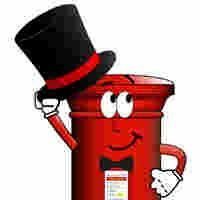 ﻿"The post box was beautiful and very handy as we posted our marriage certificate in it so it didn't get lost! The best thing was it wasn't too heavy as some are so heavy to lift and transport. Lady at the venue said it was the prettiest and lightest postbox she had ever had there!" 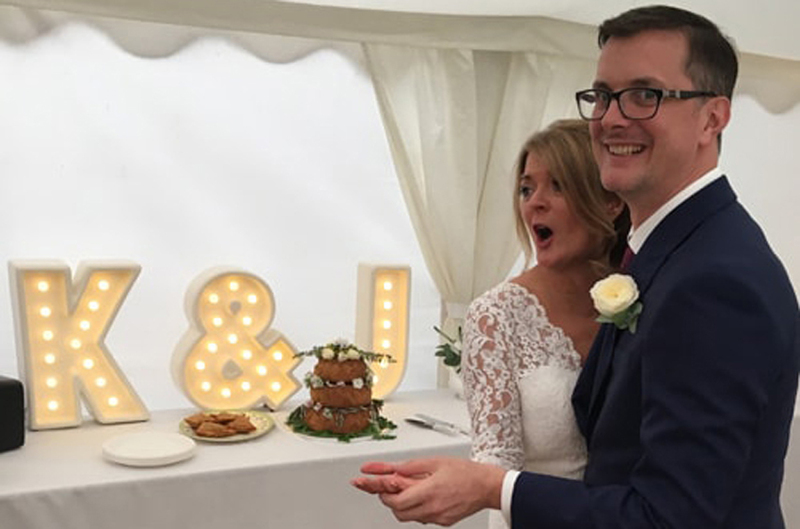 ﻿"Our postbox was just what we wanted - the colour, style and size was perfect! A wonderful service was provided. Many thanks!" Fantastic "Light Up Letters" now available to hire. 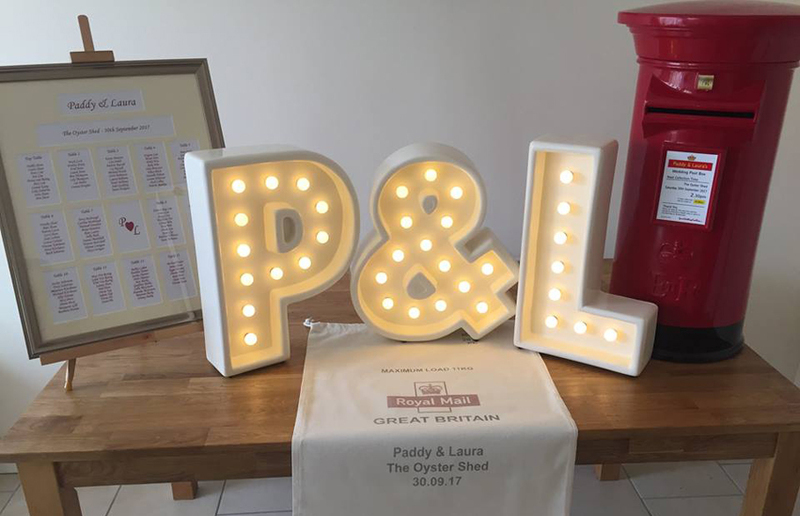 Our very own complimentary sized, simple, stylish and affordable light up letters are now available to hire. Designed and manufactured in-house our illuminated letters will spell out your love for each other! Our gorgeous bespoke designed and professionally produced table / seating plans are also available to purchase to keep. Exquisite quality printing and mounted beneath a beautifully cut window mount your guests will feel honoured to be framed in such a way! And our great post bags are also available to have personalised and purchase to keep. Enjoy dispensing your cards and gifts from your post box into a uniquely designed and printed mail bag to keep and treasure forever. The best possible prices available when a package deal is built just for you. Ask for more details. Order multiple post boxes and other items and receive additional discounts on hire and delivery. 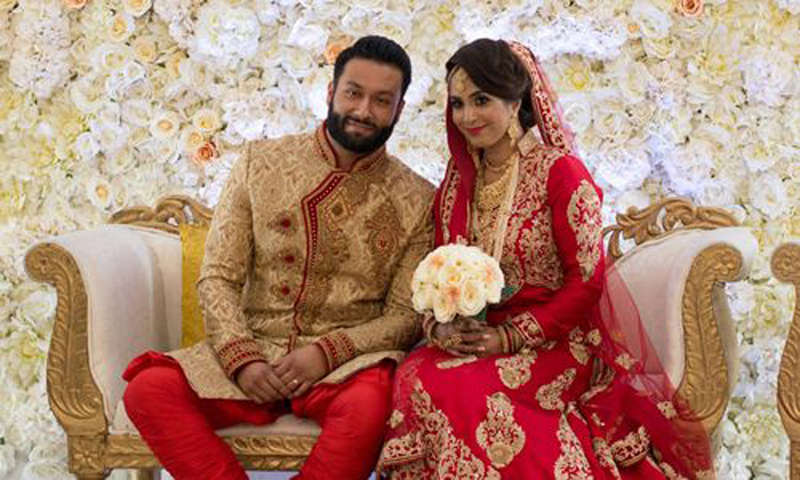 Especially popular for Indian and Asian weddings where wedding post box hire for both bride and groom is required. ﻿"Excellent customer service from start to finish. Simple and easy ordering, delivery and collection. High quality products which helped make our day so special. Looked fantastic. Many Thanks Ian & Paul"
Expecting money or vouchers as wedding gifts on your big day? Then you we will need secure and lockable wedding post box hire. Your wedding day is a once in a lifetime experience and naturally you want it to be the best day of your lives. It can be the smallest of details that can make all the difference to your big day, making your day stand out from the crowd, your day being remembered as exquisite, not just the same as everyone else’s, even forgettable. It’s with this in mind that we tailor our unique, exclusive and bespoke service to you. 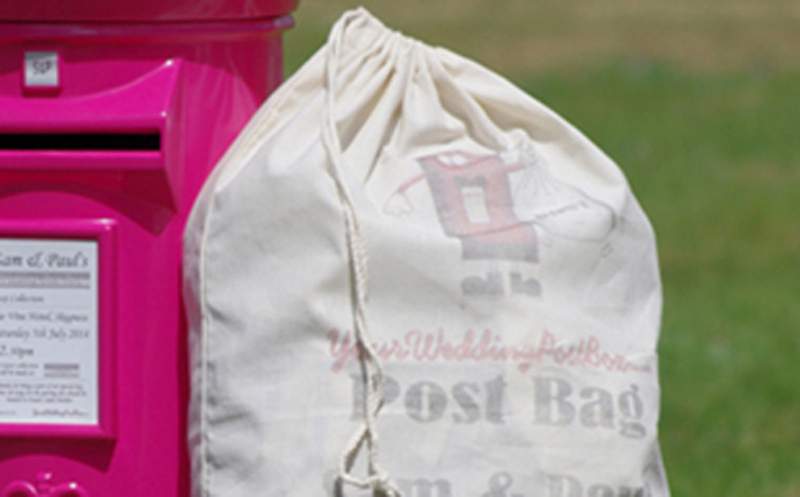 So what makes Your Wedding Post Box different to other wedding post box hire suppliers? With our exclusive product line - our very own original design of wedding post box beautifully finished in a whole host of colours, personalisation bespokely designed to the tiniest detail to coordinate with your wedding theme and personal service throughout we care and are as passionate about your wedding as you are. Congratulations! You have your big day set, your venue booked, colour scheme chosen and wedding dress and suits organised, you’ve chosen your first dance but maybe you’ve not put yourself in the shoes of your guests who will more than likely arrive at your beautiful venue clutching a valuable envelope, their wedding gift card. So you’ve found yourself asking a few questions and looking for wedding card box ideas. We like to call them a 'wedding post box' – for YOUR wedding. 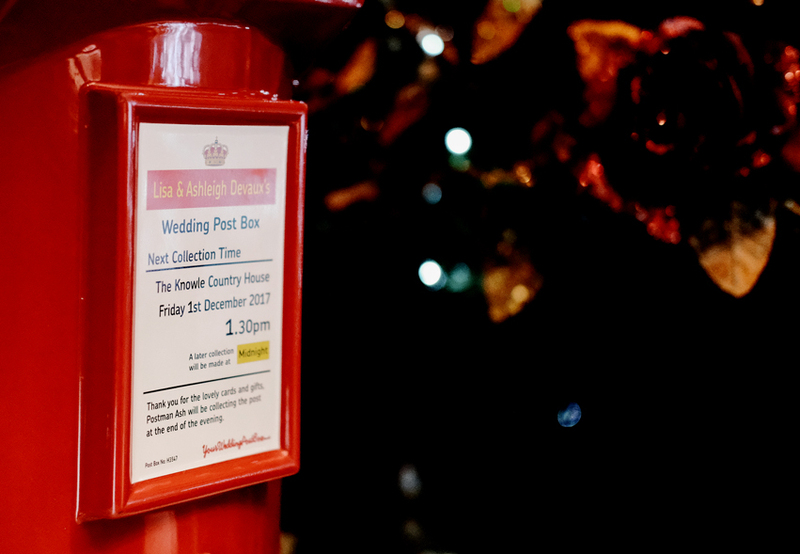 Or more simply put – Your Wedding Post Box. 'Do I need a lockable post box for my wedding?' Hiring one of our stunning, ideally sized and custom designed royal mail post box replicas is an absolute must to collect and take care of all of your wedding mail from loved ones during your wedding reception and kept safely and securely under lock and key. Although some of the meticulously planned details of your wedding may go unnoticed by your guests the one thing they will all see and indeed seek out to post their messages of well wishes and gifts is your wedding gift post box. So why settle for anything less than perfection. Your wedding post box should be stylish, glamorous and unique just like you are, not "hum drum" or "run of the mill". Your friends and relatives will instantly recognise our own uniquely designed yet distinctive and unmistakable Royal Mail post box as the safe haven for all of their cards and gifts and we professionally design and personalise the frontal information panel for you, not just with your names but with any information and to any design brief of your choosing, a truly personal service included with every hire. 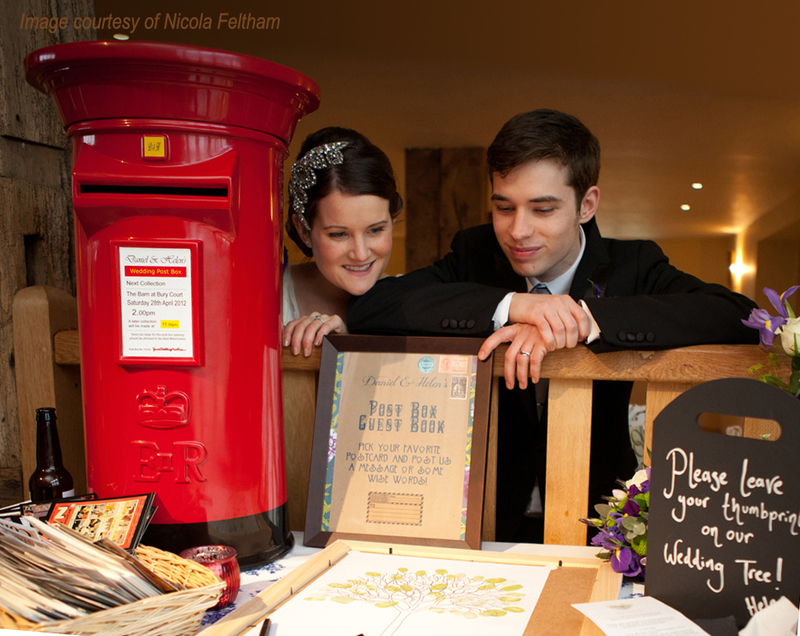 'Where can I hire a wedding post box near me?' Right here! 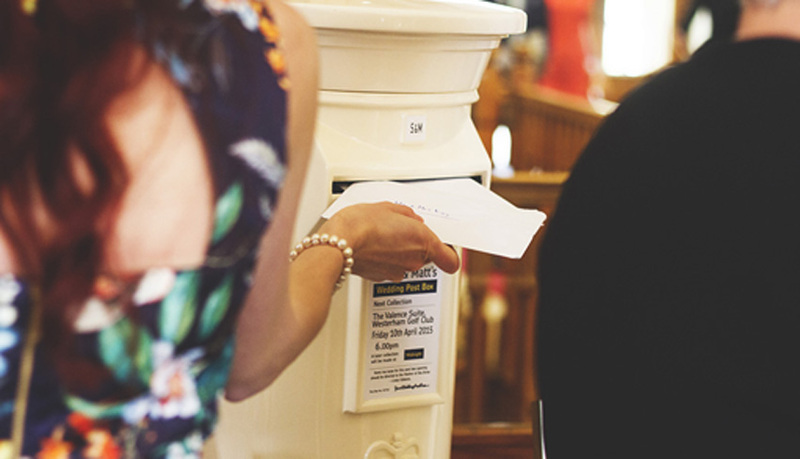 We offer wedding post box hire all across the United Kingdom including Northern Ireland with an extremely cost effective delivery and collection option or if you are local to us you are more than welcome to collect and return to us yourselves. 'Can I hire a wedding post box to match my colour scheme?' 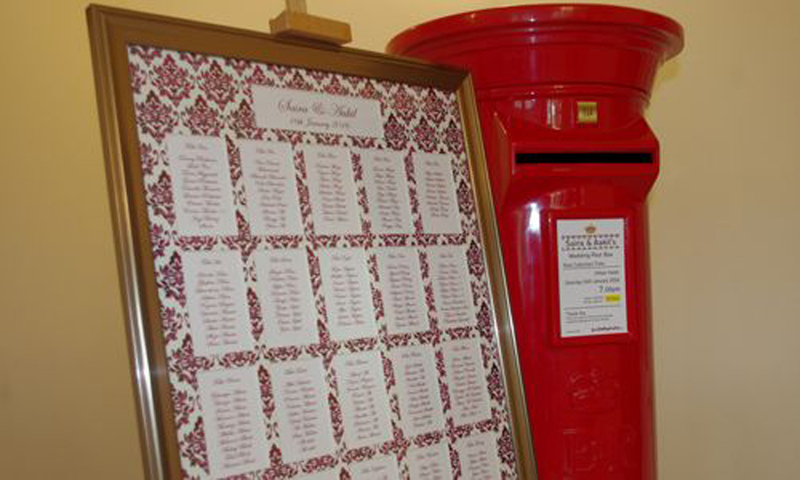 Our wedding post box hire is not only available in traditional post office red but in a multitude of beautiful colours to compliment and match your wedding theme and decor. With soft and pastel colours such as white, ivory, baby pink and tiffany blue or bold and vivid colours such as royal and navy blues, purple, green, hot pink, yellow and orange available to hire we are certain to have the perfect colour for your chosen colour scheme. 'My venue say they have a post box I can use. Why wouldn't I use that one?' Firstly why settle for second best where styling is concerned. Our wedding post boxes are beautifully unique in their styling and your wedding deserves to be special doesn't it? Secondly why would you trust the safety of your precious gifts and cards to an unknown quantity of venue staff who may be able to lay their hands on any number of keys to the venue post box, that is if it is even lockable at all! With just one key held only by you (additional keys can be requested if needed of course) you'll know that your gifts will stay exactly where they are put, in your wedding post box! Proudly standing at 2' 4" tall (71cms) our gorgeous royal mail ER mail box is the ideal size and height to take pride of place on the gift table or along with the cake and bridesmaid bouquets but taking second billing of course! And our unique top of the range item is cleverly and neatly embossed on the front with a quirky representation of the EIIR Royal Cypher of our longest reigning monarch, Queen Elizabeth II, and approved by Buckingham Palace's Lord Chamberlain's Office adding to the fun and authenticity of this unique scaled down pillar box replica. And our hire post boxes are not simply just for weddings, but can also be hired for any type of celebration such as birthday parties, baby showers, bar mitzvahs, christenings, naming ceremonies etc. And also for corporate hire such as for competition entries, questionnaire forms, seasonal decoration and promotional campaigns to mention but a few.